Last weekend, all of us stationed up in the North got together for the annual Prayer Weekend, this time in Kirungu (the same rain-foresty town that TSS took its retreat at earlier in the year.) Alicia and I were SUPER excited to go back there and and enjoy some cool breezes and stunning scenery, and quite honestly, we were in desperate need of a break from school and the students. You know, you love your home and your people, but sometimes its difficult to like them. Taking a break is a great solution, so we did. On Thursday afternoon, Alicia and I threw a mattress in the back of the Propst's truck, and set off down the long bumpy road to Kirungu. 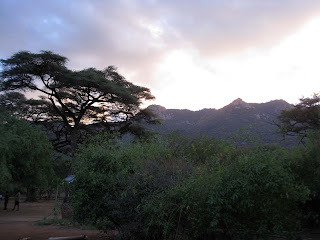 It's about a 3 hour drive all the way out to the Ndoto Hills, through the little road-side town of Illaut, down into the thick sand of dozens of dry river beds, and into the delightful greenery of the South Horr area. I put my bet on arriving at the Maple's house around 5:57pm, but Alicia won with her money on 6:07 pm. Upon arrival, we were shown into our room for the weekend in the home of an interior decorating missionary and her husband (an awesome combination to be sure.) 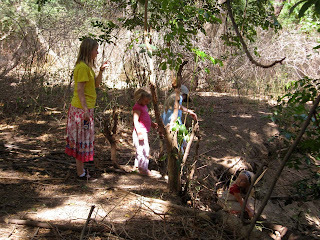 Beautiful sandstone floors, sisal thatched roof, outlines of Kenya and Africa carved into the mud walls. Fancy stuff, I know. The next few days were just as relaxing and delightful as my hotel room. 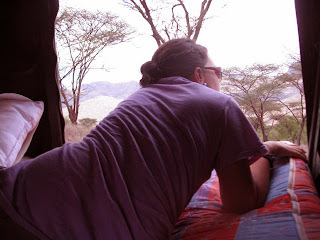 We spent several hours each day praying for the different ministries in Northern Kenya, another several hours a day eating (two chai times with too many desserts to chose from), and then more time just playing. We went on a walk out to the airstrip one evening, took a hike down the lugga where I found a porcupine quill (who knew those things lived here?! ), and Auntie Alicia and I spent some precious hours reading to the kids. Oh, and also, Auntie Alicia played "Sticky Monster" with our new favourite little 3 year old, Levi, the son of our coordinator. Levi is also the one who had the best quote of the weekend, walking up to a clearly diseased and emaciated dog and asking him incredulously in his best Scottish accent, "Why are you starving?!" On Sunday we returned to our second favourite church in Kenya: AIC Kirungu where the Mommas have brought a drum for singing and the Abbaas are all about dancing during worship. After the service, we had yet another meal and then hefted ourselves and our mattress into Nick and Lynne's truck, picked up some fruit in town, and headed back to the Kisut Desert significantly refreshed and ready to like home again.